When you think of National Hockey League general managers, you think of a group made up primarily of retired players, with a few scouting standouts and the odd math nerd thrown in for good measure. Having played the game is no doubt valuable with regards to understanding how the business of hockey works, but it’s no guarantee of success as a GM. A background in scouting or statistics might help in terms of talent evaluation, but there are still no sure things. General managing is about managing people, plain and simple. Icing the best roster possible. Ensuring team staff are current and competent. Keeping an open dialogue with ownership. Maintaining good relations with fans and the media. Pretty basic concepts, though, admittedly, easier said than done. The obvious aside, an often-overlooked component of the job, and one that touches all areas of a GM’s purview, is the management of expectations. When it comes to the NHL, the “manager” in “general manager” primarily concerns the job requirement to manage an organisation’s hockey-specific personnel, most notably the representation of said organisation in drafting, player transactions and overall team composition. Though the role is, therefore, very public, a GM’s first and foremost responsibility is towards the players. The Philadelphia Flyers have been treading water for a few years, wondering if their combination of veteran talent and skilled prospects would ever put it all together. The 2017-18 season looked to be another lost campaign – the Flyers were 8-11-7 as of Dec. 3, a start which included a 10-game winless streak. However, they turned things around in a big way, going 22-8-3 in their next 33 games. And then? Both Brian Elliott and Michal Neuvirth got hurt, leaving them without a starting goaltender. A purely cold, calculating analysis of the situation would dictate the Flyers should have chalked the unfortunate situation up to a rash of bad luck and simply stayed the course, taking their chances with their organisation’s goaltending depth. However, hockey is as mental a game as it is physical, and not knowing whether they have an NHL-ready goaltender behind them can’t be the most comfortable feeling for a team. 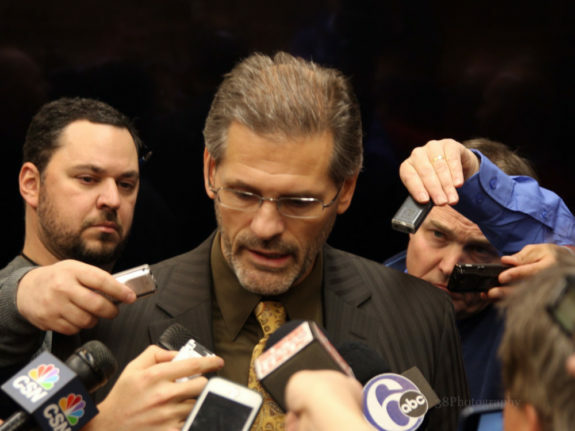 So, what did Philadelphia GM Ron Hextall go out and do? He traded for a proven NHL goaltender, Petr Mrazek of the Detroit Red Wings. Whether it was his intuition as a former player – and a goalie, at that – or simply a case of wanting to do the right thing, Hextall made a move he didn’t have to, quelling any concerns his team might have had and rewarding his troops for never giving up on their season. The New Jersey Devils are not a sure thing to make the playoffs, but they are exponentially better than most people predicted. A logical reading of the Devils is that they are, perhaps, overperforming to some degree, seeming to dictate they should stick to the development plan they have in place, riding their current wave as far as it will go. Instead, GM Ray Shero traded for pending unrestricted free agents Michael Grabner and Patrick Maroon to bolster the New Jersey forward corps. On the surface, that’s a bit of a weird strategy. Giving up draft picks and prospects in exchange for players the Devils have no guarantee of re-signing would be a risk at the best of times, let alone in a season where the team might be playing better than they actually are. However, like the Flyers, the Devils have worked hard – and against all odds, including significant injuries to Taylor Hall and Cory Schneider – to get where they are. These moves provide positive messaging to current and future Devils alike: that their GM has their back, and will reward hard work and on-ice performance with lineup augmentation. 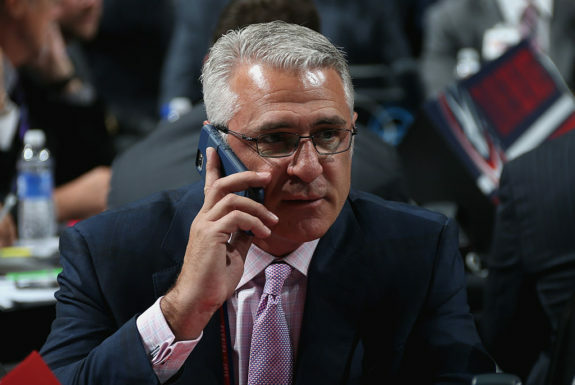 More than a few eyebrows were raised this week when Ron Francis was removed as GM of the Carolina Hurricanes. However, as noted by Elliotte Friedman, Francis did not necessarily get along all that well with new ‘Canes owner Tom Dundon. I can’t help but think Francis’ inaction at the trade deadline had a lot to do with his removal as GM. The Hurricanes desperately needed offense – in general, but also to balance out their shaky goaltending – and there was no shortage of it available at the deadline. Even with the ‘Canes battling for a playoff spot, Francis was only part of one deal, and a minor one, at that. I understand the desire to build slowly through drafting and development, but a good GM knows how to balance that with addressing the needs of the present. The ‘Canes have been playing structurally sound hockey for a number of years now, let down only by an anemic offense and subpar goaltending. Rarely are a team’s problems that clear-cut and easy to address. Francis addressed the goaltending in the summer with the acquisition of Scott Darling. It hasn’t really worked out (so far, anyway), but at least he tried. But there was nothing done for the offense, and the Hurricanes still can’t score. The players know this better than anyone; I can’t see them being overly enthused that their GM seemed ready and willing to let another season of their sweat and toil run down the drain by not getting them some help. It appears the owner didn’t approve, either. The thing is, that team wasn’t good. They were certainly a good story, particularly the inspiration provided by Nicholle Anderson (wife of goaltender Craig Anderson), whose battle with cancer captivated the hockey world. However, they had to rely on a combination of timely scoring, suffocating defense and Anderson’s brilliance in net to win games. It was just their luck that none of those things faltered last year. This season, they weren’t so lucky. You have to think, though, that Senators players knew they were running on rainbows last season. How great must the disappointment have been when, after that magical run, Dorion does nothing to improve the team, bringing back the same mediocre roster assembled with the same spit and Kleenex. And then trades one of the team’s most popular players. And then says, “I hope they got the message,” after trying to trade “generational” defenseman Erik Karlsson. Who’d want to play for that? Now, I do recognise that maniacal Senators owner Eugene Melnyk has a great deal of control, but Dorion hasn’t exactly helped his cause with his seemingly adversarial relationship with his players. It’s no wonder they tune him out. GMs have a hard job, make no mistake. Along with trying to assemble and manage a contending roster in one of the sports most influenced by randomness, GMs are also the team’s public face, having to explain every little thing they do to fans and media alike. The hopes, dreams and desires of a team’s fan base, often numbering in the millions of people, rest on the shoulders of the GM. That’s a lot of pressure, no matter how well-compensated the position might be. Needless to say, some are better at it than others. The New York Rangers, helmed by GM Jeff Gorton, did what I think a lot more teams – and the NHL, for that matter – should do: tell the truth. In an open letter to fans, the Rangers acknowledged their perennial competitiveness over the last decade-plus, but also that said competitiveness fell short of bringing home a Stanley Cup. They went on to lay out a plan for acquiring futures in exchange for current assets, in an attempt to build another contender in the near future. While unexpectedly honest and forthright for an NHL organisation, it’s also worth noting the Rangers were very much in the playoff hunt when they decided to initiate this rebuild. Most teams would be content to try and make the playoffs, squeezing out at least two games’ worth of playoff revenue. However, rather than attempting to load up and create buzz for a playoff run destined for failure, the Blueshirts were honest with themselves – and their fans. This honesty will serve them better than those few games ever could. Not only has the rebuild begun sooner – thus bearing fruit sooner (ideally), the Rangers have set a new standard for establishing trust between teams and their respective publics. 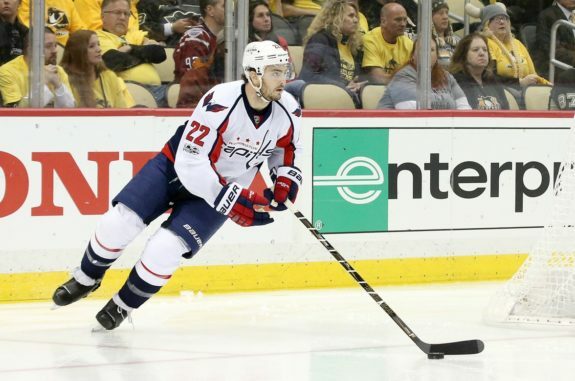 After acquiring Kevin Shattenkirk at the trade deadline in 2016-17, it was clear the Washington Capitals were going all in for a Stanley Cup. After losing in the second round at the hands of the Pittsburgh Penguins, MacLellan spoke of a “hangover” with regards to the personnel decisions the team had to make and the inevitable changes that were to come. Though this might seem like a defeatist attitude to some, I think it was a stroke of genius. Everyone could see long ago the Caps were going to run into contractual issues with several players come the summer of 2017. Plus, when a team goes out and grabs the best available piece at the trade deadline, it’s a given that great things are expected. What MacLellan did this past summer was control the expectations of the public, thereby taking the pressure off the Capitals in 2017-18 – and beyond. The general perception is that the Caps took their shot, missed and are now relegated to also-ran status, where they’ll stay for a few seasons on a slow decline into mediocrity. Anything more will be viewed as a victory. As we speak, Washington sits one point back of first in their division (with a game in hand) and still has a very dangerous roster that, even though nothing is expected of them, could very well win it all. They’ll certainly be under less pressure, thanks to MacLellan’s manipulation of their public perception. Back to Pierre Dorion, what on Earth’s going on with Erik Karlsson? The two-time Norris Trophy winner wasn’t moved at the deadline, apparently because the Sens didn’t receive a good enough offer. That likely had a lot to do with the reported stipulation that Bobby Ryan, he of $7.25 million per season until 2022, be included in any deal Ottawa might make. While I can’t exactly blame Dorion for wanting to rid himself of Ryan’s contract, there are very few teams that can take on nearly $14 million against their cap (Karlsson makes $6.5 million), let alone the number of teams ready and willing to pay over $7 million for a guy who hasn’t hit 60 points since 2010-11. Even if they were able to package the two, the team that takes them on would have all the leverage in the negotiation; Ottawa would get very, very little in return. Dorion’s inactivity looks to be a catastrophic error. Logic would dictate Karlsson would have had far more value with one regular and two playoff seasons left on his contract, instead of the one of each he’ll have if dealt in the offseason – or the single playoff if he’s dealt at next year’s trade deadline. 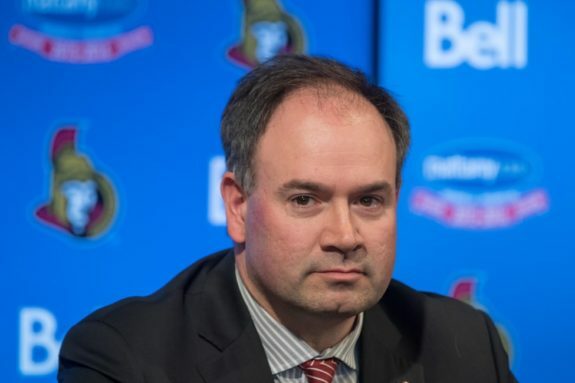 Teams know the Senators are over a barrel; I can’t see many GMs giving Dorion a deal. That said, Colorado Avalanche GM Joe Sakic, long the target of ridicule regarding his reluctance to deal Matt Duchene, managed to salvage his reputation by executing a brilliant three-way deal to get himself out of a bad situation. So there might be hope yet. Unfortunately for Dorion, he was the GM who made that trade possible, and he was also the one who came off worst. Again, I do recognise Eugene Melnyk’s hands-on, penny-pinching ownership style likely has a lot to do with Dorion’s actions (or lack thereof). Regardless of the level of Melnyk’s involvement though, it’s Dorion who has to wear it. As it’s been said, “the Canucks have blamed injuries and a lack of depth for their inability to make the playoffs over the past three seasons.” What helps with those things? More skilled players; Jim Benning is supposed to be rebuilding the Vancouver Canucks. They need to acquire draft choices and prospects to do so. And yet, he’s done everything but stock up on picks; the Canucks have no draft choices other than their own in the next three drafts. Moreover, he stubbornly clings to outdated notions of what really matters when constructing a competitive hockey team. One such example? Re-signing Erik Gudbranson to three years and $12 million, abhorrently pricey for a defenseman of his calibre. To rub even more salt in the wounds of the Canucks faithful, he then mentioned Gudbranson in the same breath as Zdeno Chara. Not only is Chara one of the very best defensemen to ever play the game, he was also one of the chief villains in Vancouver’s heartbreaking defeat at the hands of the Boston Bruins in the 2011 Stanley Cup Final. Could Benning not have found someone else – anyone else – to use to try and sell people on Gudbranson? I’m not quite sure what Benning’s plan is here. They’re not making the playoffs – and they’re not even particularly close. But they’re also not fully committing to a rebuild. Or any build, for that matter. As we saw at the trade deadline, they’re not doing much of anything. Yes, they are in line for another high first-round draft choice. And yes, there is already some very promising talent in the pipeline. But, on the whole, what message has Benning sent to the fan base other than the Canucks are going absolutely nowhere? No one ever said being a general manager was easy; GMs face enormous pressure from fans, media, players and ownership. However, there are some pretty basic best practices that, should GMs choose to make use of them, will more than likely land them in good stead. Things like being realistic about a team’s potential, being honest with the fans, getting the most for expiring assets, and showing loyalty and appreciation to players for a job well-done. GMs are a bit like politicians; their main focus is to keep their job. That’s why it’s curious so many seem to be doing everything possible to secure a pink slip.